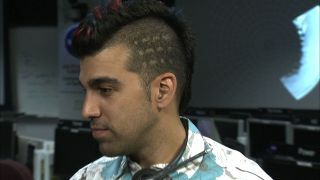 Life is good for NASA's "Mohawk Guy." He became world famous after helping NASA's huge Curiosity rover make a dramatic landing on Mars, and now he'll sit with first lady Michelle Obama during Tuesday's State of the Union address. The Iranian-American Mohawk Guy — whose name is Bobak Ferdowsi — will sit in the first lady's box to highlight President Barack Obama's call for more visas for skilled immigrants in the fields of math, science and engineering, Southern California Public Radio reported Monday (Feb. 11). A White House official confirmed the news to SPACE.com. Ferdowsi's American flag-inspired hairstyle — a red- and blue-streaked mohawk set off by white stars on the side of his head — rocketed the mission flight director to international fame during Curiosity's nail-biting landing on the night of Aug. 5. In a complex maneuver that had never been tried before on another planet, the 1-ton rover was lowered to the Martian surface on cables by a rocket-powered sky crane, which then flew off and crash-landed intentionally a safe distance away. The president even gave Ferdowsi a public shout-out shortly after the landing. "I understand there's a special mohawk guy that's working on the mission," President Obama said in a congratulatory call to Curiosity's handlers at NASA's Jet Propulsion Laboratory on Aug. 13. "He's been one of the many stars of the show last Sunday night. I in the past thought about getting a mohawk myself." Ferdowsi is not a mohawk loyalist, however. He said he has tried out various hairstyles over the years to mark major milestones in the development of Curiosity's $2.5 billion mission, which seeks to determine if the Red Planet can, or ever could, support microbial life. Curiosity carries 10 science instruments, 17 cameras and several other tools to aid in this quest. Over the weekend, it completed a major milestone, drilling a 2.5-inch-deep (6.35 centimeters) hole in a Martian rock and collecting samples. No robot had ever done this on Mars or any other planet before. Ferdowsi also marched in President Obama's inaugural parade last month, along with life-size models of Curiosity and NASA's Orion manned space capsule.